food suppliers may pass their savings onto restaurants because their suppliers will be paying less. so restaurants should be able to lower their price by 7%. Yeah, I read that but that graphic didn't make sense to me. I didn't think people paid tax on food and companies can apply for a PST number to exempt them from paying PST on raw materials. The model on the website doesn't really explain that there are lots of PST exempt items in the current system. Thanks for posting this. just to clarify the PST is currently exempt on restaurant meals but after the HST is implemented on July 1, it will apply to all restaurant, fast food, and even coffee bills. That is an additional 7% on the 5% you are now paying. Theoretically, yes the HST is supposed to help businesses save on administrative costs but how many may pass them onto consumers? Also many restaurants are already suffering due to the economic receession so this is just poor timing from the government. i hate this whole HST thing... thanks for the link. "food suppliers may pass their savings onto restaurants because their suppliers will be paying less." I agree it will cause people to eat less but they will get over it, we love our restaurants. I am not in favour of taxes but why should one industry be free of tax and not another? Ontario has always paid PST on restaurant eating. We have paid 105 on booze, that will go away.The HST is a refundable tax for businesses where PST is not. A $100,000 renovation will now cost a restaraunt $100,000 not $107,000 and the knives and fridges etc are going to be 7% cheaper. 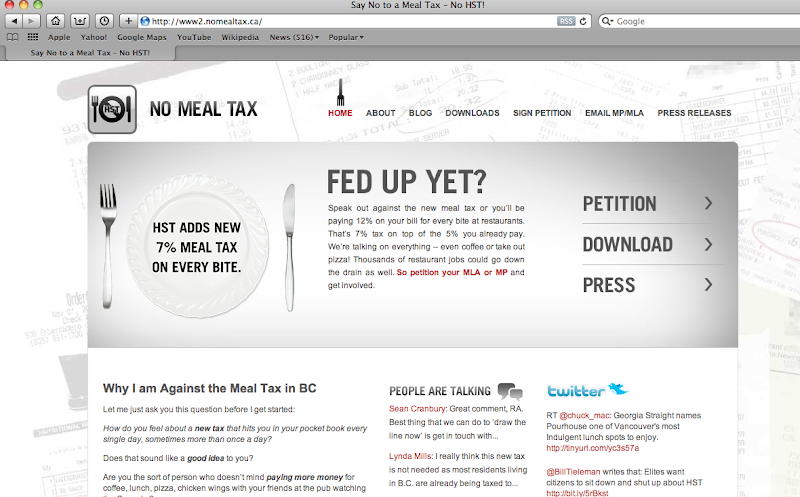 HST will add costs to consumers but kill restaurants? Only the bad ones. We pay pretty low taxes for the social & economic support we receive as Canadians. Look at some EU countries and what they pay for taxes. People want their cake and eat it too it seems. If a 7% tax on my dinner helps pay for education and health care, I don't really mind it at all. People need to get their heads outta their asses. Well, a goods and service tax is suppose to apply to everything and then certain items are exempted on the basis that they are required to live (ie basic groceries) so taxes them would hurt the poorest in society. I don't really consider restaurants a necessity or foodies poor. If a tax is suppose to apply to everything, why should restaurants be exempt?